These are fluid-filled bags or sacs, usually very small although they can become quite large, which are within a woman's ovaries. All ovarian cysts contain fluid to some degree. There are a number of reasons why some women should have cysts yet others have not. The commonest one is due to what is known as a follicular cyst. A follicle is a normal part of egg development, and is the fluid-filed sac that contains an egg. This usually bursts to release the egg but on occasions it may not, and continues to grow but then usually settles by itself over a period of weeks to months. Conditions such as polycystic ovary syndrome predispose women to growing ovarian cysts, and there may be cysts with blood in them - called haemorrhagic cysts - which are due to the leaking of blood from small blood vessels into an egg sac. Very occasionally, ovarian tissue grows abnormally to form cysts with other body tissue in them such as hair or teeth. These are known as dermoid cysts. Most women with ovarian cysts have no symptoms at all. If symptoms do occur, pain in the lower abdomen or pelvis, sometimes worst around mid-cycle is common. Large cysts can twist on themselves and so affect the blood supply to them causing pain. Cysts that rupture may cause severe pain or discomfort at the time, and in polycystic ovaries there may be weight gain and skin hairiness too. Yes. Ovarian cysts are diagnosed by ultrasound scans, which are painless and identical to ones pregnant women have. Very large cysts can sometimes be felt by examining the abdomen but this is uncommon. Blood tests, such as a CA-125 test can evaluate the potential of a cyst to become malignant, especially if there is a strong family history of ovarian cancer, but this test can be flawed. Women with an elevated CA-125 may have no cancer whereas a normal level need not exclude cancer, so it must always be used in association with ultrasound scans. Most cysts require no treatment. Any cyst which is causing persisting symptoms, is enlarging or which causes concerns medically is removed surgically. This is usually through a keyhole, or laparoscopic incision and only requires a larger scar if the cyst is too large to remove otherwise. Ovarian cysts usually resolve spontaneously and cause no problems. The main problems requiring medical treatment include rupture of the cyst, bleeding into the cyst or twisting round on itself to cut off its blood supply. It is important to report any unusual abdominal pain, especially if this is around the time of ovulation, and any abdominal swelling should never be ignored. If there is a strong family history of ovarian cysts or tumours it is sensible to ask your doctor whether regular scans or blood tests may be useful in your particular case. 1. Do you know of any family history of ovarian problems? 2. Have you noticed any swelling of your abdomen? 3. Do you have any abdominal pain? 5. Do you have any unusual vaginal bleeding? 1. Do simple ovarian cysts ever turn cancerous? 2. Is my fertility affected by ovarian cysts? 3. Is it safe for me to be on the contraceptive pill? 4. 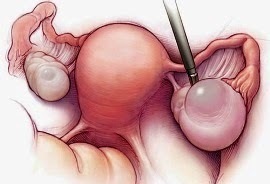 Can I still get ovarian cysts if I have had a hysterectomy but still have my ovaries? 5. Will I need regular check-ups as I get older? Address: PO Box 935, Harrow, Middlesex, HA1 3YJ. Telephone: 0845 608 4455 and 0208 423 8999.